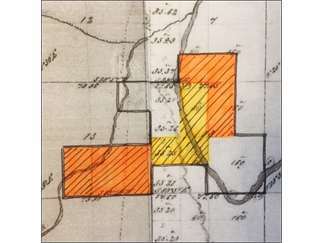 Land ownership research is a rewarding addition to any family history. Discovering an actual visual location matching a homestead, journal or memoir description is quite exciting, and the process can lead to a treasure trove of information. However, the process can be daunting not knowing where to begin or how to navigate through the data. Vanessa Ivey, Deschutes Historical Museum manager since 2011, has taken on land research requests over her eight years with the Museum, and will share her expertise in finding records at out monthly meeting on January 15. Using examples from both her personal and work land searches, Vanessa will tell us about universal survey terminology, how to navigate the BLM website, and what the Deschutes County sites have to offer. Together with a new understanding of the fundamentals of where and what to look for, you’ll have the keys to unlocking another piece of your family history’s puzzle. Come to Williamson Hall on Tuesday, January 15, enjoy a morning cup of coffee, and lively conversation about genealogy. Plus, learn a lot about researching land records for your family history. The DNA INTEREST GROUP begins after the program meeting ends at 11:45 to Noon. If you are interested in DNA for Genealogy, you are welcome to stay for the interest group discussion. Bring a brown bag lunch, if desired. The DNA Group usually ends before 1:30 p.m. The Bend Genealogical Society (BGS) is for anyone interested in their family history, beginners and experienced researchers alike. We want to help you.